In search for The Perfect Brownie. 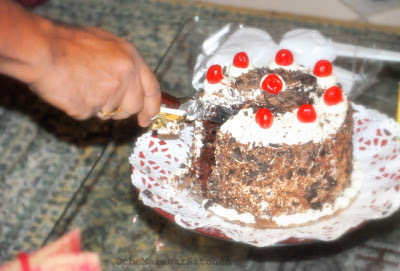 Black forest cake or gateau is originally a German dessert, which is now popular around the globe. It’s called ‘Schwarzwälder Kirschtorte’ in German, which literally translated, means Black forest cherry torte. Usually it consists of two or more layers of chocolate cake separated by cherry filling and whipped cream, and decorated with whipped cream and chocolate shavings and finally topped with whole cherries. There are quite a few versions for this cake, but most of them rotate around this basic combination. I did a quite a bit of research before setting out to make my first Black forest cake. The base recipe is derived from my sister’s recipe journal. She learnt it at her ECA class at school. I did a little improvising to the original recipe. It’s an assembled combination of 4 parts – chocolate cake, cherry filling, whipped cream, chocolate ganache and finally the icing. The decoration is up to your imagination, although it usually consists of whipped cream, a good amount of chocolate shavings and whole cherries. This is my first Black forest cake. I made it for my Dad’s 50thbirthday. We gave him a surprise party too by the way. · Sift all the dry ingredients together. Keep aside. · Add the eggs, milk, oil, vanilla essence and vanilla sugar to a bowl and mix very slowly with a wire whisk. · Add the dry ingredients to the bowl. Mix gently, without forming any bubbles. · Add the water and blend it into the batter. · Pour the batter equally into two 8” baking dishes. · Bake this at 180⁰C for 35-45 minutes or till a skewer inserted comes out clean. I kept it for 45 minutes. · Once it’s done, tilt it onto a wire rack and let it cool. I made the cake the previous night so that it cooled completely. Now for the cherry filling, though the original recipe asks for ‘Kirschwasser’ rum, a clear liquor distilled from tart cherries. Apparently other liquors are also used such as rum, which is common in especially common in Austrian recipes. I used ordinary rum as I couldn’t get my hands on Kirschwasser. In the United States, Black Forest cake is most often prepared without alcohol but German statutory interpretation states Kirschwasser as a mandatory ingredient; otherwise the cake is legally not allowed to be marketed as Schwarzwälder Kirschtorte. If you do not prefer to use alcohol, you can skip it. It’ll make a difference to the taste, but I can guarantee that it would still taste great. · Add all the ingredients except the rum to a bowl. Mix slowly till all the ingredients are well combined. · Finally add the rum and combine. Keep aside. The next part is the Whipped cream. This is used for the filling as well as for the icing. · Whip the cream, sugar and vanilla sugar (or essence) at high speed, till it thickens and becomes light and fluffy. Keep aside. · Add both the grated chocolates and the rum to a bowl and set it aside. · Add the cream to a heavy sauce pan, and heat it over a low flame. Turn off flame as soon as it starts to boil. Do not let it boil completely, as it will spill out of the saucepan. ·Pour the hot cream over the chocolate and rum and whisk it with a wire whisk, till it turns into a smooth mixture. Set aside and let the mixture cool completely. When all the parts are ready, you can assemble the cake. · Start by placing one of the cakes on a cake plate. · First spread half of the ganache on the cake evenly. · Then add a layer of whipped cream to cover the top portion of the cake layer, saving the rest for icing the cake. · Next add all of the cherry filling and spread it evenly. · Now place the second cake on top, aligning it well with the first layer. · Pour the remaining ganache over this layer and let the cake soak it up a little. · When the ganache hardens, start the icing. · Spread the whipped cream all over the cake neatly. · Once that’s done, decorate with the chocolate shavings as per your imagination. I patted it up around the cake, leaving the top portion; you need to be careful not to spoil the whipped cream coating. · Next you can use an icing cone to make small mounds with the whipping cream on the top and place some cherries around, all this is upto your imagination. You could spread some chocolate shavings too on top. · Finally, when you’re done with the decoration, refrigerate the cake for a couple of hours before serving. Enjoy your cake! !